A link to the transcript of his recent CBS 60 minutes interview. 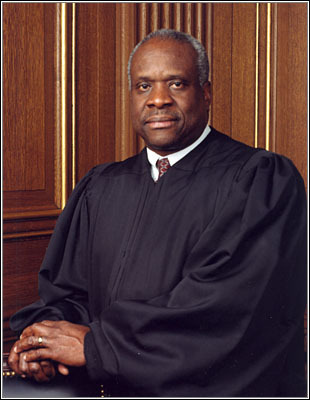 I had an experience with Mr. Clarence Thomas that ruin my life. I applied for a position as department head of the Business Department in Evansville, Indiana at a high school that was predominately white. At the time I had a Masters' plus thirty hours above and fifteen years of teaching experience. The only white woman that also applied for the position had ten years of teaching experience and no hours above her Masters. She got the job. I filed with EEOC. That was when Clarence Thomas was in charged. The corporation wrote him telling him that I got the education after the white woman got the job. This was a lie. He then wrote me telling me that I could not file. I said that they were lying and all he had to do was check my college transcript. He or whoever worked under him would not listen to me. As a result, I was placed on probation on and off for sixteen years. They did not want me to ever get a higher paying job. It was hell. He deserve all the bad he got because he did not do his job where I was concerned. I wrote a book about it LIVING BELOW THE SNAKELINE by Delores Harvey. This was my maiden name. I was told that Blacks were cursed in the Bible and that is why I was having so much trouble. I was also told that Black children failed because I reminded them of their Black History. They said that Black History was negative and should be forgotten. I taught there thirty-one years and got out. Umm Shaka, I don't get it. Was Thomas the root behind the spread of the stigmatism against blacks? The comment goes a bit in too many directions. I'm not sure who you are blaming. You might want to find out whether Thomas even heard your case or whether it was someone else. If he was in charge, it is likely he didn't. Also, who is 'They'? I wrote directly to Mr. Thomas. If he passed my letter on to someone else just shows that the office that he controlled did not do right by me, therefore he did not do his job. He went along with the establishment. What was the purpose of the position? Was it to continue to discrimination that was already there? That is what it did. I got in more trouble for filing which was not supposed to happen. I did not talk about stigmatism against blacks. I only spoke about my personal experience. I am presently praying for the power to forgive and forget because the Lord has handled it.
" Here's a snippet: "On November 4, 1994, Malveaux famously stated of Supreme Court Justice Thomas: "I hope his wife feeds him lots of eggs and butter and he dies early like many black men do, of heart disease....He is an absolutely reprehensible person." "